A new adhesive sensor can save patients the discomfort and pain resulting from leaky intravenous drips. A significant number of hospitalized patients require the insertion of a thin tube, called a cannula, into a vein, usually in their hand or arm, to facilitate easy and sometimes lengthy delivery of drugs. If the vein is small or fragile, such as is often the case in infants and the elderly, or the cannula is misplaced or moves, the drugs can leak into the surrounding tissue, causing swelling, pain, and sometimes, in severe cases, death of the tissues and impaired function of the limb. Clinicians and nurses do monitor the cannula site for leakage, but this can sometimes be challenging and very small leakages can be missed. Researchers at the Agency for Science, Technology and Research (A*STAR) Institute of Microelectronics in collaboration with clinicians from KK Women's and Children's Hospital in Singapore have developed an adhesive sensor that can detect as little as two millilitres of leaked fluids. The sensor can be incorporated into the dressing normally used to fix a cannula in place. 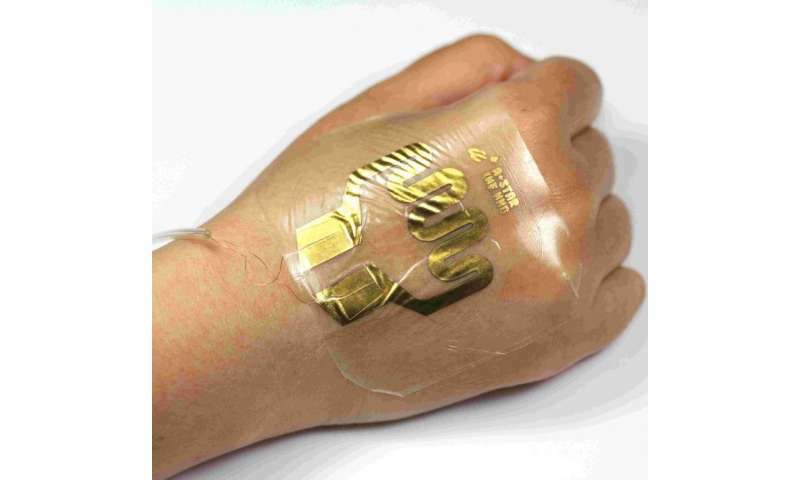 It is made of very thin electrodes embedded between two elastic polymer substrates. The electrodes stretch when a leakage into the tissues stretches the skin. This in turn changes the resistance in the sensing electrode, which is detected by a 'reader' connected to the sensor. The reader is battery-run and reusable, while the sensor patch is disposable and does not require a battery. The team has successfully tested its sensor in lab experiments. The researchers next plan to develop a wireless module that can wirelessly alert healthcare workers of a leakage through a mobile application, allowing for immediate intervention. They will also work on making the sensor more cost-effective: they expect it to cost less than US$1 per sensor patch. Further work will include conducting more comprehensive clinical trials for the sensor patch system.